Popsicles were a staple of my summer growing up. Summer just wouldn't be summer without them. They go hand in hand with slip-in-slides, chigger bites, tree houses and all day bicycle excursions. Usually my parents would buy us a box or two of some off-brand, chemically flavored, two stick popsicles, but when those ran out, it was up to my brother and I to get creative. Mom had an old Tupperware popsicle mold from the 60's that we used to make our own lemonade/ kool-aide/ orange juice popsicles. Little did I know that these early experimentations in popsicle artistry would someday inform the art of adult gourmet popsicles making. These popsicles are pretty simple to throw together and you can create just about any iteration that inspires you. 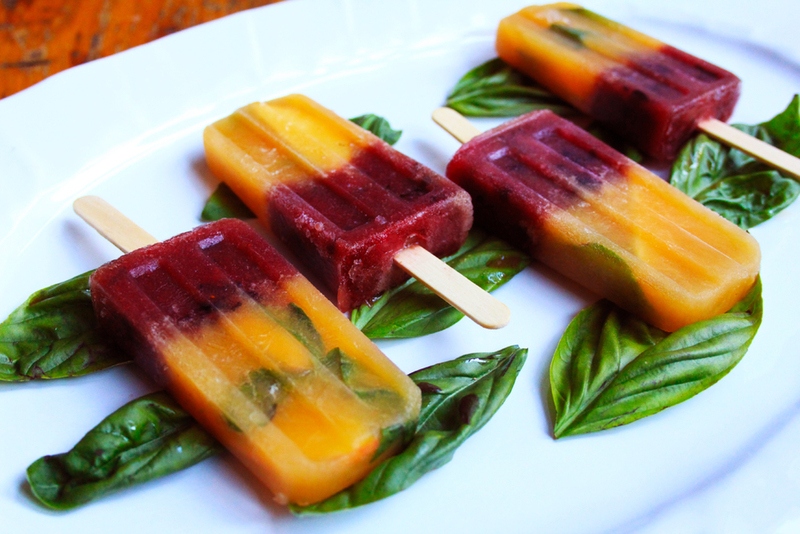 I brought these popsicles with me to a dinner party and handed them out after dinner for desert, but you could hand them out before dinner on a hot summer night for a fun twist on the summer cocktail. Use a juicer to juice the peaches and blueberries. Juice all but 1/2 of one of the peaches and a handful of blueberries. Make a simple syrup out of the sugar using 1/2 cup boiling water and the 1/4 cup sugar. Mix the gin with the peach juice and half of the simple syrup. Mix the blueberry juice with the Chambord and the rest of the simple syrup. Fill the popsicle molds almost halfway with the peach mixture and add 2 thin peach slices and 2 basil leaves to each mold. Freeze for 1 hour. Remove from freezer and add the blueberry mixture to the molds along with 2-4 berries per mold. Place sticks into the molds and freeze for at least 3 hours before serving.